I had hoped to have a picture of the finished Lotus Moon Tile Afghan, this post, but it is not to be, silly person that I am I forgot that there were triangles to do to make the sides straight. I sat down to do them yesterday and realised I didn’t have enough white, and the shop where I get that particular wool is closed on Saturdays! Lucky the deadline is next Friday, lol. So that gave me an opportunity to start my next CAL, The Julie YeagerSweet Pea Mystery ‘Ghan. My inspiration is a watercolour I did earlier in the year, I love water colour as you can get the colours to merger into each other as the petals of sweet peas do. I have spent ages trying work out my colour scheme and in the end decided to use a long variegated wool and a silver grey as the main. So here is week 1 clues, they come out on Wednesdays/Thursdays, so it is a nice feeling not to be lagging behind as I usually am. During the week I dragged out another UFO, Colourful City Bag, a project bag that was part of a Cal on the Colouirful Cals group on Ravelry. I am dreadful at doing the finishing touches of projects as I am eager to get on to the next project, but I want to keep my Sweet Pea Bits and Pieces in it. I have to line and sew the zip in and add handles, so quite a quick job really, I made a butterfly to pin to the side as I felt it needed something to match the lettering. I don’t know if I have said that I love vintage doilies, while I was in town last week I came across these in a local charity shop, all for $2. Of course I had to get started on one, I think I will do the whole set. Will make a wonderful gift for a family member who is into vintage china. Well that is it for today, and I will finish the Lotus Moon this week or I will be trouble, as Kendal wants it for her birthday sleepover! 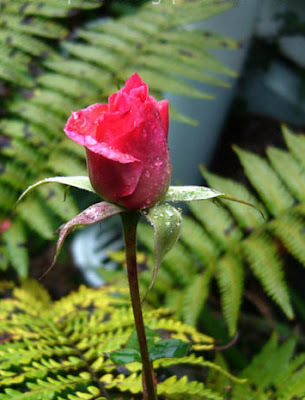 Here is a very early rose poking its head through the shrubbery! A promise of Summer. All your creations are beautiful !!!!!!!!!!!!!!!! 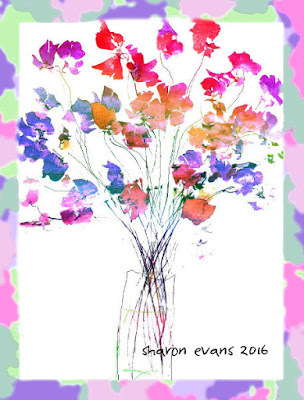 Love your watercolor flowers !!!! Love your water color!!!! Omg it's beautiful. Also love that bag. When it's finished I WANT IT. Fantastic projects. You've inspired me this week. I love how colorful all your projects are!!! So frustrating to run out of yarn. Love vintage doilies. I collect vintage pattern books. So much fun! I probably have some of those same vintage crochet booklets....and I don't even crochet. My grandmother and both my great-grandmothers could knit and crochet and when my great-grandmothers passed away, my grandmother inherited a bunch of their knitting & crochet supplies (which was odd because my grandmother was a late-comer to fiber crafts of any kind, including sewing...she didn't really start until after she was married), and then when she passed, I got all of them. Of course, family history is part of why I keep them.....but I also like vintage things like that. Sometimes, I think it would be worth it to learn to crochet just to make some of the outrageous doilies from the 60s. There's really something wonderful about hearing of spring and summer on the other side of the world just as we're heading into autumn. Your post reminds me - I bought a bunch of crochet and knitting books and pamphlets at a library book sale a few weeks ago. I've been meaning to take a picture. Next week! Hopefully I don't forget. I look forward to watching your Sweet Pea Mystery ghan grow over the upcoming weeks. And seeing your completed Lotus Moon Tile blanket! How fun! Okay...let us count the many loves on this post....your watercolor is gorgeous! How talented and gifted you are! I adore the crochet along circles. The variegated is beautiful and the gray really makes the colors stand out and the design too. I want that bag, or at least I want to make one. What really grabbed me were the words on the bottom. So unique! I love doilies and keep flubbing them up. I need to make a solid colored one so the design is the feature. I like your pink color and only hope I can do one with a tiny hook. You had a very productive week and Happy Summer to you and your beautiful rose. Love your yarn choice for the CAL. I'm saving the posted instructions for that Cal, but I have too much on my plate to make it at the moment. Love your inspiration painting for it, and that is a great project bag for it. Hope you get around to finishing it. I'm always searching op-shops for the older doily patterns as well. Can never have enough patterns. Your watercolour is amazing as are all your projects. I LOVE finding vintage patterns in thrift stores. It makes me feel closer to my granny and auntie. Love the little butterfly. I love the watercolour, it is beautiful. Also, the bag is fabulous. My goodness, you are a very talented artist. I love your painting and the colors are beautiful! I can't wait to see how this new afghan takes shape. I remember how beautiful your lotus afghan was looking. I look forward to seeing it completed. It looks you are on the other side of the world from me. You are welcoming spring and I am welcoming fall. Fall is one of my favorite times of year because of the beautiful colors. It seems as if my comment was not taken, so here I go again ;-). Your watercolor painting is fantastic! The variegated yarn you used for the circles is perfect, and I think the light grey looks much better than if you’d chosen white. The colorful bag looks great and I know what you mean about the finishing touches… I have a crocheted granny bag laying around for 2 years that only needs the lining but I’m a very bad sewer… and there are 4-5 shawls that only need to be washed and blocked, but I hate that… :o). The butterfly is really sweet and the perfect eyecatcher for that bag. Doilies I do love, too, can’t wait to see your finished one(s)! Hugs and have a great week!